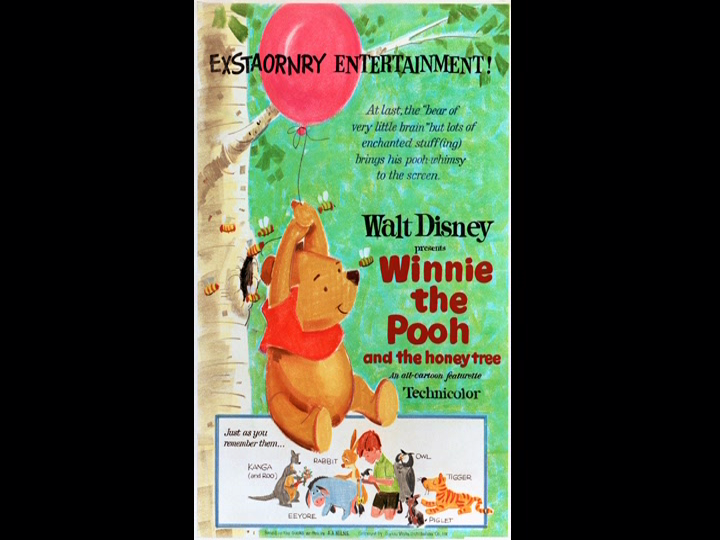 On February 4, 1966, the cartoon featurette Winnie the Pooh and the Honey Tree was released to theaters. It was the first Disney animated version of the classic Winnie the Pooh stories by A.A. Milne, and was later combined with two other Pooh featurettes to become the 1977 animated feature The Many Adventures of Winnie the Pooh. Although the featurette mostly stays true to the source material, it did veer in the addition of a new character, Gopher, who continually points out that he’s “not in the book, you know.” The featurette also features several musical pieces by the Sherman Brothers. 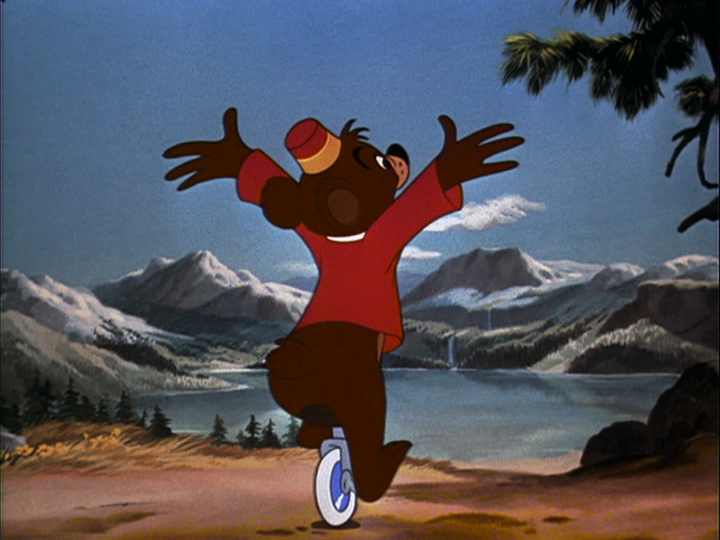 The segment was directed by Wolfgang Reitherman, and starred Sebastian Cabot as the narrator, Sterling Holloway as Winnie the Pooh, Bruce Reitherman as Christopher Robin, Ralph Wright as Eeyore, Howard Morris as Gopher, Barbara Luddy as Kanga, Hal Smith as Owl, Junius Matthews as Rabbit, and Clint Howard as Roo. The featurette begins with Pooh’s clock going off, but Pooh can’t remember why. Pooh finally remembers that it’s time for his stoutness exercises, which he performs with great enthusiasm, until he splits a seam, which he immediately stitches back up. His stomach then makes a noise, and Pooh realizes that it’s time for his favorite sweet treat. Unfortunately for the bear, he is completely out of honey. As he gets his nose stuck in a honey jar, he hears the buzzing of a bee around his head, and follows the bee to the window, seeing the bee enter a tree. Pooh realizes that this must be a honey tree, and climbs the tree. As he nears the bee’s nest, he is unable to get the honey, and falls from a branch, landing in a gorse-bush. He then decides to go to Christopher Robin for help. Christopher Robin is helping Eeyore reattach his tail, with Owl, Kanga, and Roo supervising. Pooh finds the group and asks him for his balloon. When Christopher Robin asks what it’s for, Pooh lets him know of his plan to get the honey from the honey tree. 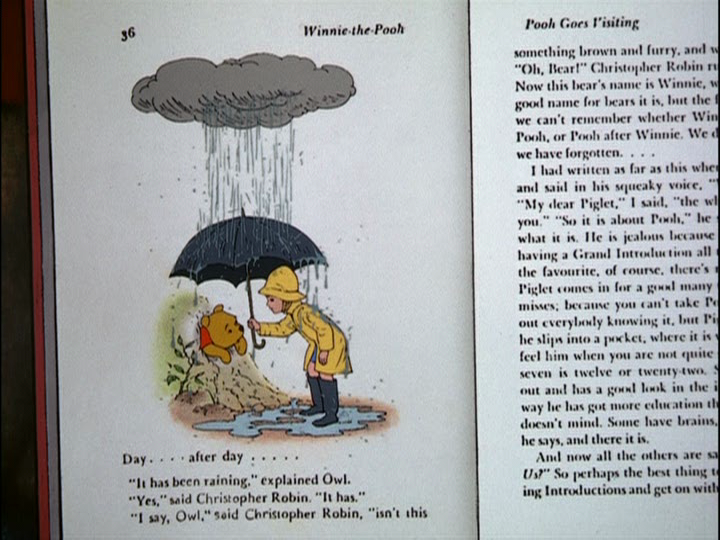 Christopher Robin takes Pooh to a muddy place, where Pooh covers himself in mud to look like a “little black rain cloud.” Christopher Robin hands him the balloon, and Pooh soars towards the bee hive, singing a song about being a rain cloud. He manages to reach inside to take a handful of honey, not realizing that his hand is also covered in bees. When he puts his hand in his mouth, Pooh is startled, but soon spits out all the bees. Angered at the deception, the bees then swarm around Pooh, and as Pooh swings around, he gets his behind stuck in the opening of the hive. The bees laugh, but the ones inside the hive push Pooh out, and he is left holding on to dear life to the balloon, which has been released from its string and is flying around frantically. 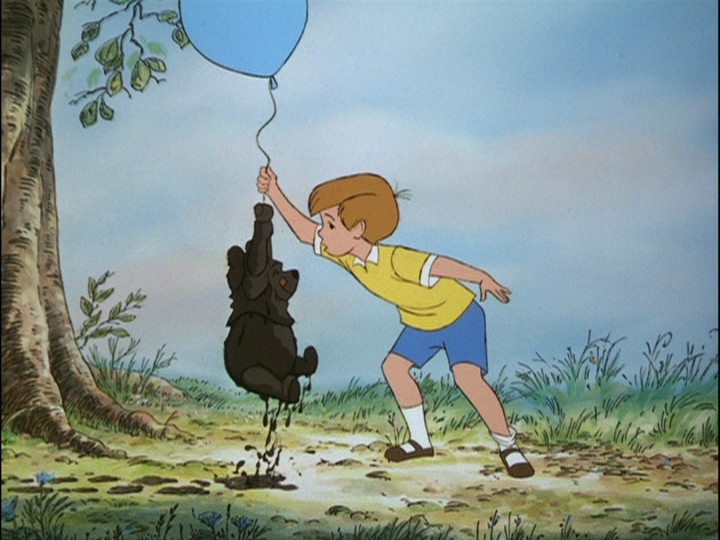 Finally, the balloon completely deflates, but luckily, Christopher Robin is able to catch Pooh. The bees then plan their next attack, but Christopher Robin and Pooh are able to hide in the mud puddle. Still on a search for Honey, Pooh stops by Rabbit’s house, hoping Rabbit will share his honey. Rabbit doesn’t want to share his food with Pooh again, but Pooh enters anyway, and Rabbit is stuck offering his food to Pooh again. Pooh eats several jars of Rabbit’s honey before deciding to leave, but gets stuck trying to get out of Rabbit’s house. Rabbit then runs out the back door to go get Christopher Robin to help, and Owl stops by to help. When Owl says that they need an expert, Gopher pops out of the ground, and surveys the situation. Gopher declares that it will take three days to dig Pooh out, before thinking that dynamite is the best way to go, but disappears down a hole. Christopher Robin soon appears and tries to pull Pooh out, but the group then decides that the best thing to do is wait for Pooh to get thin again. Rabbit tries to make the best of the situation by decorating Pooh’s backside as a hunting trophy, which is ruined when Pooh sneezes thanks to the flowers Roo gave him. Pooh waits days to get thin again, keeping poor Rabbit awake the entire time. Gopher appears again with his lunchbox, which tempts a very hungry Pooh. When Rabbit hears Gopher say he has honey, he races from his house and places a sign in front of Pooh: Don’t Feed the Bear. Finally, one morning, Pooh is able to move, and everyone gathers to pull Pooh out from Rabbit’s house. The group manages to pull Pooh out, and he soars across the Hundred Acre Wood, into the Honey Tree. When they go to find him and pull him out of the tree, Pooh, is satisfied staying stuck in the tree, as he gets to eat all the honey inside. Posted in Uncategorized and tagged 1960s, Animated, Color, Featurette, Winnie the Pooh. Bookmark the permalink. 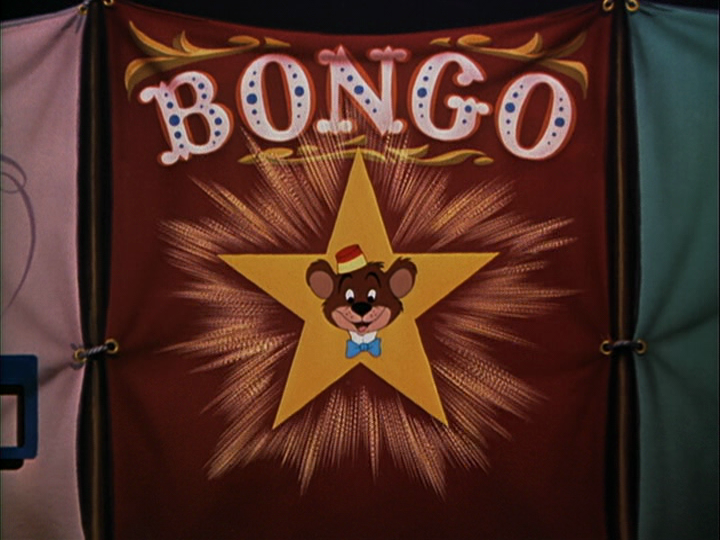 On January 20, 1971, the Bongo segment from the animated feature film Fun and Fancy Free was released as a featurette. Based on the children’s story “Little Bear Bongo” by Sinclair Lewis, first published in 1930, it was originally slated to be a complete feature film, but the production was interrupted by the onset of World War II. In the end, with Bongo and The Legend of Happy Valley (later retitled as Mickey and the Beanstalk) were turned into a package film, as neither one was considered to be sophisticated enough to stand alone as a feature film. Bongo was narrated by musical star Dinah Shore. The story begins with Dinah explaining that Bongo was the star of the circus, able to do any trick that was asked of him. He performs a tightrope trick while juggling several dozen items before jumping off the tightrope and landing on a wet sponge. However, life isn’t all that glamorous for Bongo, as he is chained and sent into a cage after the performance, “tossed around like an old shoe.” He dreams of living out in the wilderness, away from the circus, trains, and his current life. But every day it’s the same, he’s called out to perform, and then sent back into his gilded cage. One day, having had enough of his life, he decides to follow the call of the wild and escapes from his cage. Free at last, he travels the woods excitedly, stopping to smell the flowers and jumping over tree roots. He meets the other animals of the forest, who laugh at his inability to act like a bear. He doesn’t get easily discouraged, as he is just happy to be free. That night, Bongo attempts to sleep, but is disturbed by the sounds and experiences of the forest before he gets caught in a storm. In the morning, Bongo wakes up to find himself on the ledge of a cliff, is very discouraged at his situation, as he doesn’t know how to act like a bear. He worries that he made a mistake, especially when he can’t catch anything for breakfast. He soon meets a female bear named Lulubelle, and the two proceed to flirt as they frolic through the woods. Lulubelle and Bongo quickly fall in love, gathering all the attention of the bears in the woods. However, a bear named Lumpjaw, who also has feelings for Lulubelle, soon hears news of Lulubelle’s new beau, and decides to break the happy couple up with the intent of stealing Lulubelle for himself. He starts fighting Bongo, but Lulubelle stops Lumpjaw from beating him up, and then punches Bongo herself. Bongo is heartbroken, thinking that Lulubelle no longer loves him, and when she tries to punch Bongo for a third time, Bongo ducks, and she hits Lumpjaw instead. Bongo was unaware of the bear custom that slapping is a sign of affection, and sadly walks away while everyone else celebrates the “happy” couple of Lulubelle and Lumpjaw. As he looks back at the scene of the bears, he finally understands that bears “say it with a slap,” and goes back to challenge Lumpjaw. The two duke it out, and Bongo emerges victorious, using skills he learned in the circus. Bongo is reunited with Lulubelle, and gives her an affectionate slap, which she returns in kind. Posted in Uncategorized and tagged 1970s, Animated Feature Film, Color, Feature Film, Featurette, Package Film. Bookmark the permalink.